It’s hard to imagine that, someday in the future, queues of solemn tourists might file through Abu Ghraib and Guantánamo. 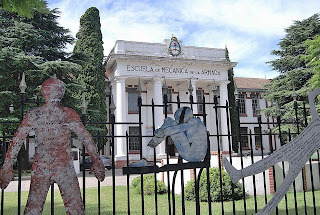 Thirty years ago, though, it would have been equally unthinkable to suggest that, in 2010, groups of Argentine and foreign visitors would stroll the grounds and halls of Buenos Aires’s Escuela de Mecánica de la Armada, the naval mechanics’ school that was the most notorious clandestine torture center during the military dictatorship that ruled here from 1976 to 1983. 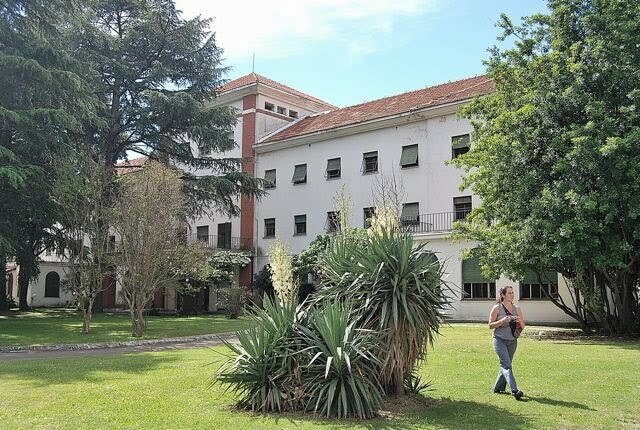 Today, the ESMA - a cluster of handsome buildings with neoclassical touches on a wooded campus in the northern city barrio of Núñez - is the main physical site of Memoria Abierta (Open Memory, link in English), an organization dedicated to preserving the grim history of state terrorism. 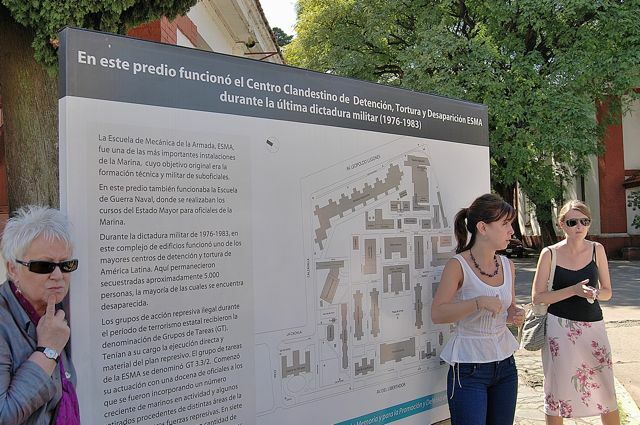 Touring it, as I did Monday morning, is a draining experience - but not in the way it was for the more than 5,000 “desaparecidos” (disappeared persons) incarcerated, abused, and (mostly) executed here or pushed from helicopters (alive but drugged) into the Río de la Plata. Before his term expired in 1999, President Carlos Menem - himself a victim of the repression, though he later pardoned his junta jailers - relocated the institution to Puerto Belgrano, near the city of Bahía Blanca in southern Buenos Aires province. At the same time, he ordered the ESMA's demolition and its replacement by a dubious "monument to national unity." In the end, public outcry prevented the ESMA’s destruction. Menem's decrees infuriated human rights groups and city officials, who saw the former ESMA as the most gruesomely suitable location for a facility that would preserve and present documentary records, oral histories, sound, film, and photographs of the period. 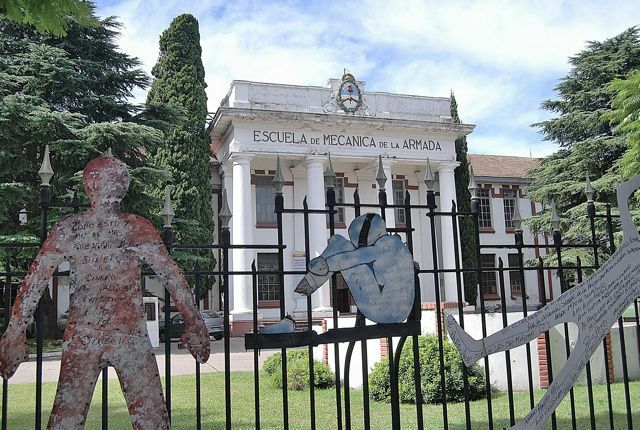 In early 2005, then President Néstor Kirchner and Buenos Aires mayor Aníbal Ibarra announced agreement to move remaining naval educational facilities elsewhere and open the ESMA grounds to visits. Today’s tours visit the grounds and just one building, the Casino de Oficiales (Officers’ Club, pictured here), where most of the torture and other abuses took place. Astonishingly, even as torture took place in its basement and guards shoved shackled and hooded prisoners up and down the stairs - the poorly insulated third floor and the attic were areas of coffin-like confinement - officers lunched in the café and even slept in the second-floor hotel rooms. In a extraordinary instance of Orwellian linguistics, the military’s human rights abusers dubbed the basement corridor that led to the torture chambers the Avenida de la Felicidad (“Avenue of Happiness’). Meanwhile, parts of the third floor became impromptu maternity wards for female prisoners whose babies eventually went as adoptees to military families and civilian collaborators (in total, about 500 children were born in captivity, though not all of them here). Astonishingly, at the same time, there were acts of resistance even as some detainees appeared to collaborate. ESMA survivor Víctor Basterra, for instance, was a graphic artist who made fake IDs for military kidnappers who used them to claim their supposed relatives’ belongings (which were distributed as booty from a room called “El Pañol”). At the same time, on “conditional liberty,” he smuggled out copies of photos - a truly sinister rogues’ gallery - that later served to identify many of the torturers. In reality, the three-hour ESMA tour is a mentally draining experience that, although I’m glad I did it, I have no desire to repeat. I can only imagine what stress the guides, who do this several times a week, must go through: though the job requires many of the same skills of any tour guide, it’s a grim task, and jokes and small talk are totally out of order. On request, tours are available in English and, soon, in German. Interior photographs are not permitted. About every two years, in the course of updating Moon Buenos Aires, I spend a couple weeks in coastal Uruguay, which figures among the book’s excursions. This year, events in Chile also demanded my attention while I was in Colonia, Montevideo, and Punta del Este, so that I haven’t written much about my most recent forays across the River Plate. 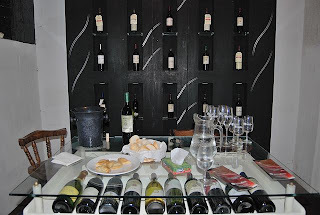 Still, I did manage to visit several wineries that I had never seen before, three of them in and around Montevideo, and one just outside Punta del Este, to supplement some of my earlier coverage of the Uruguayan wine world. Uruguay can’t compete with the South American giants of Argentina and Chile, of course, but its unique red Tannat gives its an opening that it otherwise wouldn’t have, and producers have made the most of it. A few years ago, they united to create the Caminos del Vino route for tourists, mostly but not exclusively in and around Montevideo. Two of the affiliated Wines of Uruguay members I visited are so close to downtown Montevideo that they’re really urban wineries - since its creation in 1898, for instance, Bodegas Santa Rosa has seen the sprawling capital eventually surround it and it no longer has any vineyards here. Now only about a 20-minute taxi ride from downtown, it’s still run by the founding Mutio family, of Basque origins with several generations actively involved; for visitors, it offers an entertaining visit through a maze of tunnels, lined by oversized barrels that are now only for show, that culminates in a huge open space that serves for weddings and other events. Smaller gatherings, including tastings accompanied by cheeses and cured meats, take place in a quiet alcove. Barely a bike ride away from Santa Rosa, founded by a winemaker who split off from Santa Rosa to found his own company, Bodegas Carrau has a wine-making history that dates back to 18th-century Catalonia. Most of the vineyards are in Las Violetas, about half an hour west, but there’s a small experimental vineyard here that, in season, means visitors can taste the grapes before sampling the final product in its tasting room, to the accompaniment of cheeses and cured meats. In addition to its Las Violetas vineyards, it also has Uruguay’s highest vineyards at Cerro Chapeu, on the Brazilian border near the northern town of Rivera. One of the most recent additions to the wine route is Bodega Marichal, where descendents of a family of Canary Islanders have been in the area since planting its first vineyards--now consisting of 50 hectares of Tannat, Merlot, Cabernet Sauvignon and Cabernet Franc, Pinot Noir, Chardonnay, Semillón and Sauvignon Blanc about 50 km west of the capital--in 1910. 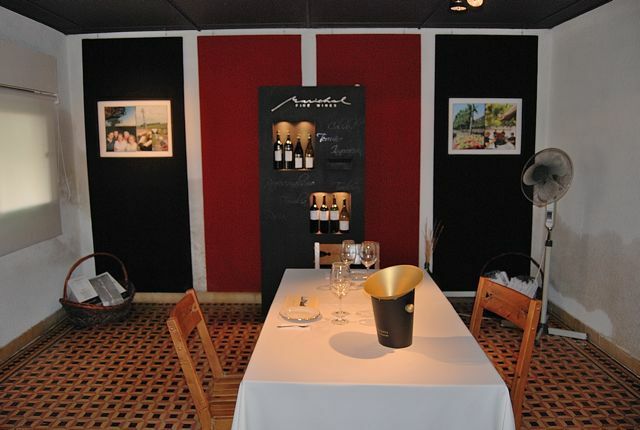 Having only recently switched to fine wines, Marichal has done a fine job of renovating the historic house of its founders (the winery proper dates from 1938) as a tasting room. Its idea is to use tourism as yet another means to promote its wines, rather than as a revenue-generating activity per se, but it also offers snacks and meals on request. In sheer tourist appeal, the winery most likely to succeed is Bodega y Viñedos Alto de la Ballena, for its proximity to Punta del Este. On Punta’s western outskirts, the low range of hills known as the Sierra de la Ballena disappears beneath the Río de la Plata estuary but, to the north, it forms a rolling landscape that now includes the winery and vineyard planted with new vines of Merlot, Tannat, Cabernet Franc, Syrah and the white Viognier. 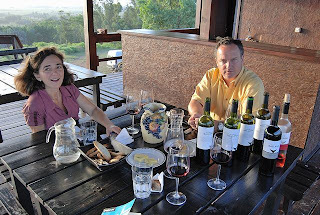 Owners Álvaro Lorenzo and Paula Pivel, who released their first young wines in 2007, are proudest of their unusual Tannat-Viognier blend; the winery and grounds are ideally situated for sunset tours and tasting from its west-facing deck. 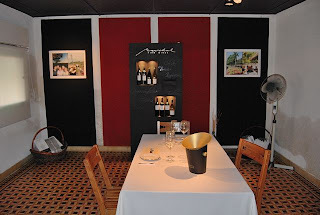 Most of Uruguay's wineries require 24 hours’ notice for a visit, but some can handle tourists on short notice, so it’s worth phoning just in case - on short notice, though, the smallest wineries may not be able to provide English-language guides. Alternatively, Montevideo’s Daniel Reyes is an agency that offers scheduled half-day tours, in Spanish and English every Monday, Wednesday and Friday. At irregular intervals, I write about Southern Cone topics, such as visas and money, that change from time to time and affect the traveler’s experience. In fact, I wrote recently about Argentina’s imposition of a “reciprocity fee” for United States, Australian, and Canadian citizens, but it wasn’t until last week, when I flew from Santiago de Chile to Buenos Aires, that I experienced it personally. In another post, I’ve detailed my objections to the reciprocity fee, which I won’t repeat in any detail here other than to say that I think it’s a foolish measure. Suffice it to say that, on arrival at Aeropuerto Internacional Ministro Pistarini (popularly known as Ezeiza), the only airport where the fee is collected, Americans, Australians and Canadians pass through a separate line where they pay their fees: US$131, US$100, and US$70 respectively. 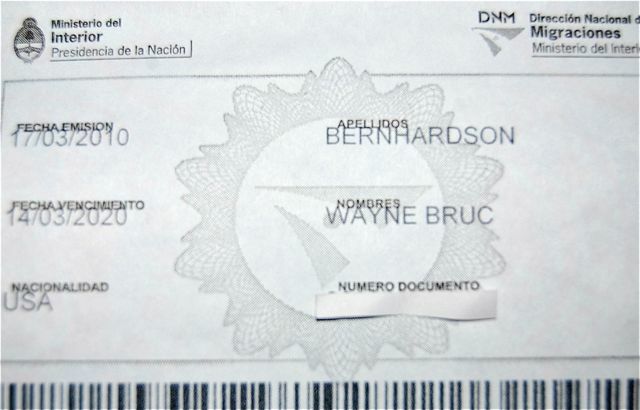 Payable in cash or by credit card, the fee (as depicted in the receipt above) is valid for ten years for Americans, but only for a single entry for Australians and Canadians (apparently, lobbying by US ambassador Vilma Martínez managed to obtain this concession from the Argentines, but her Australian and Canadian counterparts have neglected their duties in this matter). The Argentines have done a poor job of explaining the details - no information whatsoever about the fee appears on the immigration department's website - and one of my concerns was that it would only be valid until the expiration of my passport in November. The cashier, however, confirmed that it was valid for ten years no matter what, and suggested that I carry my expired passport along with the new one just in case; although I would be in their database, my new passport will have a different number. This was a relief to me, of course, since I travel frequently to Argentina, but it does not deal with the real issue. Amortized over a decade, the fee is a minor inconvenience to me; to a one-time visitor, especially with a family, it may be a deterrent to visiting the country. For instance, a family of four visiting Argentina and Chile (which collects a similar fee at its international airport) would incur more than US$1000 in “reciprocity fees,” and might well decide to vacation elsewhere--especially since the airfare to get here is so much higher than, say, Mexico or Costa Rica. Chile, which hopes to jump start its tourism industry after the recent earthquake, would do especially well to rescind its “reciprocity fee.” A contact in the Chilean sector recently wrote me that they hope the new government will be receptive to the idea. 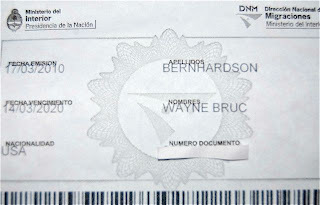 There is at least one exception to the Argentine measure, by the way: my Argentine wife, a naturalized US citizen, was not required to pay when she used her US passport on arrival at Ezeiza in January: "I was told twice upon arrival that if you got US citizenship before 1981 Argentina considered you American, and thus you would pay. Since I got mine in 1985 I am exempt. However, they have to take your word for it, because nowhere in your US passport does it say what year you became nationalized." On another issue: Argentine ATMs, in both the Banelco and Link systems, have raised their charges on overseas transactions to 15.50 pesos (as indicated in the photo here), the equivalent of US$4; the former charge was US$3. The maximum daily withdrawal per account is 1000 pesos, but in reality it’s a bit less because they add the fee on top of the withdrawal. One way to minimize these charges is to take the maximum out per day - in the case of Banelco ATMs, it’s possible to take out in multiples of ten pesos, up to 980 pesos which, with the charge, comes to just under the maximum. In the case of Link ATMs, it’s multiples of 50, so the real maximum is 950 pesos. Still, one relatively large transaction is always better than several smaller ones. Banks in Uruguay, where I recently spent ten days while updating my Buenos Aires book, charge US$3 per transaction. In Chile, meanwhile, the state-run Banco del Estado still does not collect an overseas transaction charge at its ATMs. This is a huge improvement over a few years ago, when only its own plastic worked at its many branches - in smaller Chilean towns, it is often the only bank. During my brief stay in Santiago, I was unable to verify whether the handful of private banks, such as Banco Desarollo and Corpbanca, are still not collecting the fee. Other Chilean banks impose a fee of US$3 or US$4. Last Sunday, I drove from Mendoza (Argentina) to Santiago de Chile, a slower trip than I anticipated but not because of earthquake damage - rather, on the Chilean side of the Libertadores border crossing, there’s a great deal of overdue roadwork going on. Nevertheless, the crossing itself was smooth and, until I approached Santiago from the north on smoothly paved Ruta 57, there was no sign whatsoever of damage. The main damage was to part of the roadway - in a couple places, bridges were slightly displaced and a detour reduced traffic to two lanes. Most notable was the collapse of segments or more of several pedestrian overpasses that crossed the freeway, but the main roads themselves are on balance in good condition. Fortunately, when the quake hit at about 3:30 a.m. on February 27, few cars were on the road and nobody, apparently, on the overpasses. 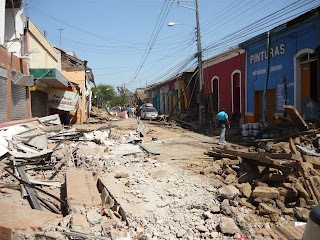 During my three days in Santiago, I stayed in Barrio Brasil, where walls had tumbled from several adobe structures, most notably those with vacant lots alongside them - in previous quakes, such buildings supported each other but, with no additional reinforcement, many walls have collapsed. Many of these buildings are beyond repair, and you can see into some of them as if they were dollhouses with cutaways. On the night of my arrival, a brief blackout brought people out of their houses and apartments onto the sidewalk, but only to chat in an atmosphere of utter calm. 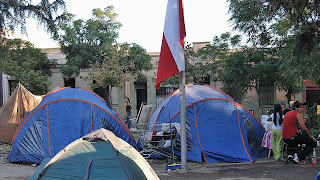 In adjacent Barrio Yungay, some families are still camping in the parks, as the apparently solid exteriors of some buildings disguise precarious interior walls. In many locations, police tape marks places where too close an approach is inadvisable. 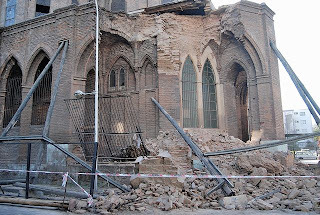 The last big quake, in 1985, had its epicenter near the coastal city of Viña del Mar, but damaged structures such as the Basílica del Salvador (pictured here), which the Catholic church had delayed repairing in hopes of getting a government bailout, is in imminent danger of collapse. The best-case scenario here would be to dismantle most of the building and leave the ruins as an historical monument - much as happened with many colonial churches in Antigua, Guatemala’s colonial capital that is now the country’s top tourist destination (Barrio Brasil’s Basílica dates only from 1892, however). Despite the visible damage, there are many positive signs in the capital. One of the highlights of my stay was a visit to the destination restaurant Zully, where owner Joe Westrate (a Michigander married to a Chilean) has recently acquired an adjacent mansion - until recently occupied by squatters - that he intends to turn into a boutique hotel; with about 25 rooms on five floors, it includes a spectacular rooftop terrace with views of the city and the Andes. In Barrio Concha y Toro (a Barrio Brasil enclave that was home to Santiago’s early 20th-century elite), the building seems precarious now - the flashlight tour that I took with Joe made me happy I hadn’t been there during the big one - but its potential is enormous. With all the focus on the quake and its aftermath, other significant happenings have also gone unnoticed. 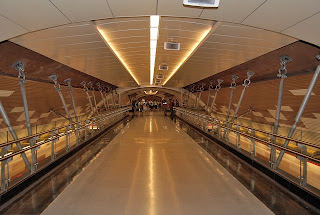 Only two months ago, on the Metro’s oldest line (dating from 1976), a three-station extension has opened, including the gleaming Estación Manquehue (pictured here). Enzo Paci, of the hop-on, hop-off tour company Pachamama by Bus, told me he sent a group south from Santiago that spent the night in the surfing capital of Pichilemu, which was relatively untouched by the tsunami despite its proximity to the quake’s epicenter. Early Wednesday morning, my cab ride to the capital’s Aeropuerto Internacional Arturo Merino Benítez was utterly uneventful - though we saw one freeway bridge that had been displaced by about a foot. With the main international terminal building still closed - when the quake broke windows, it also set off sprinklers that caused water damage - the check-in was nevertheless quick and efficient. Concessionaires have set up in big tents outside the domestic terminal, where all passengers now depart from. 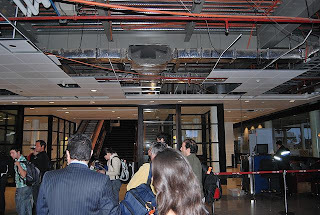 Despite many missing acoustic tiles in the ceilings, everything was routine, my flight for Buenos Aires left on time, and the undamaged runways were so smooth I was hardly aware that we had lifted off. 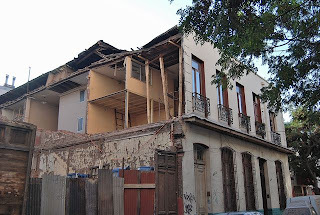 I have just returned to Buenos Aires from Santiago, where I spent two-plus days exploring Chile’s post-quake capital and barely had time to sleep, let alone write any extensive blog posts. Within a few days, I’ll have a summary up, but for the moment I’ll just note that things are returning to normal - despite a brief Sunday night blackout that extended from the Atacama desert town of Taltal in the north to the archipelago of Chiloé in the south - and that flying out of Santiago’s Aeropuerto Internacional Arturo Merino Benítez was utterly routine, even if the main international terminal building remains closed. At present, I would not hesitate to visit Chile’s top destinations - San Pedro de Atacama, Easter Island (Rapa Nui), and Torres del Paine. These sites were left totally untouched by the February 27 quake, and intending visitors should have no qualms whatsoever about traveling there. The southerly lakes district, just beyond the quake zone, is up and running as well, but overland transportation is slower than usual because of highway damage between Santiago and Temuco. At the moment, flying into Temuco or Puerto Montt and then traveling far shorter overland distances to popular towns such as Pucón and Puerto Varas would be a better option. One place I would not recommend visiting, though, is one of my favorite destinations in the country. On Isla Robinson Crusoe, the biggest island in the Juan Fernández archipelago, the post-quake tsunami swamped the immediate shoreline of San Juan Bautista, the island’s only settlement. For a community of only about 600 people, the loss of just a few lives was devastating, and several if not most of its tourist facilities were destroyed, as can be seen in the FACh (Chilean Air Force) aerial photographs provided me by a Santiago friend, conservationist Hernán Torres. To enlarge the before-and-after photos for more detail, just click on the image. According to spokesman Miguel Díaz Gacitúa of CONAF (Chile’s national park service), with whom I spoke on Tuesday in his Santiago office, the island’s airstrip is undamaged, but San Juan’s tiny port facilities will need an emergency replacement. Presumably, all rebuilding in the village will take place beyond the line of tsunami damage. Díaz Gacitúa adds, by the way, that there has been no noteworthy damage to any of Chile’s national parks or other protected areas - even in the hardest-hit regions - and they are open for business as usual. As I wrote in an earlier post, the Chilean earthquake - at least compared with its Haitian counterpart - is more an economic than a humanitarian disaster. Admittedly, it’s not either/or - the number of deaths in Chile is small compared with those in Haiti, but it would be cruel to tell someone in Concepción who’s lost everything that “you’re not so bad off,” even if they’re not starving and Chile’s dry Mediterranean climate doesn’t expose them to torrential tropical rains and diseases. Still, according to The Economist, one initial assessment said that the damage to Chilean could amount to something between US$15 and US$30 billion, about 20 percent of the country’s GDP. Some of those losses involve the wine industry, where epoxy-lined concrete vats cracked, stainless steel tanks toppled, barrels went rolling, and bottles spilled from their racks and shattered on the floor. According to Matt Ridgway, who lives in the hard-hit Colchagua valley, some of the irrigation canals turned red with the spillage, but the valley is gradually reopening for business, with hotels, restaurants, and wineries again ready to serve the public. I myself am leaving for Santiago Saturday morning by car, and expect to arrive there Sunday night, to provide some first hand information on the Chilean capital and its airport, which is currently operating at about half capacity (I am flying back to Buenos Aires next Wednesday morning). Personally, all my close friends and acquaintances are safe and accounted for - I was most concerned about one who lives in Concepción, the city most affected by the quake and its aftermath, but I just got an indirect report on him. Meanwhile, for those concerned about Chile’s future, buying Chilean products and traveling there - don’t wait too long - will help the country recover. At the same time, there are many options for people who want to contribute directly to quake relief. The Chilean Embassy in Washington DC has a page of links for donations. Good choices include Un Techo Para Chile (A Roof for Chile) , which specifically works on quickly erecting inexpensive but sturdy shelters for homeless people, and the Catholic relief agency Hogar de Cristo. Late Update: Shortly after I posted this in Montevideo, Franz sent out another email that I missed because I was on the Buquebus shuttle back to Buenos Aires. Everyone at Casa Chueca had moved out of the house because of another aftershock, around 7.0 (roughly the strength of the Haitian quake) on the Richter scale. 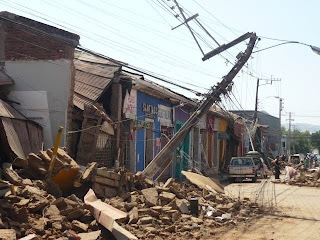 Apparently there is notable damage in the city of Rancagua, about 90 km south of Santiago. Meanwhile, Sebastián Piñera is now officially president of Chile. For only the second time, Argentina has taken home a “Best Foreign Film” award from the Oscars. Last night, the Academy awarded the statuette to director Juan José Campanella’s “El Secreto de Sus Ojos” (The Secret in Her Eyes, subtitled trailer), starring Ricardo Darín and Soledad Villamil (pictured here) in a noirish crime drama with political overtones that takes place mostly in 1999, but incorporates a flashback from the 1970s, before the coup that overthrew civilian authority in 1976. Its critical theme is the legacy of Argentina’s traumatic period of political violence. Argentina’s only previous Oscar-winning film was director Luis Puenzo’s “The Official Story” (1986), a drama about the infant children of detained and "disappeared" prisoners during the so-called “Proceso de Reorganización Nacional,” as Argentina’s military rulers euphemistically called their reign of terror. Many Argentines disliked that film, in which Norma Aleandro plays an upper-class woman who slowly comes to realize that the origins of her adopted child are open to question, partly because it seemed to imply that the public could be unaware of what was going on around them. I haven’t yet had the opportunity to see Campanella’s film, which is one of the most popular in the history of Argentine cinema, but it’s definitely on my short list. 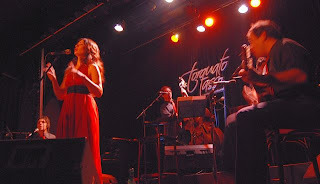 I have, however, seen Darín’s co-star, who frequently sings tango at San Telmo’s Centro Cultural Torquato Tasso. If you want an up-close look at a Oscar winner (or at least a major participant in an Oscar-winning project), the Tasso can be the place to do so (though not scheduled there any time very soon, she also sings elsewhere in Buenos Aires). 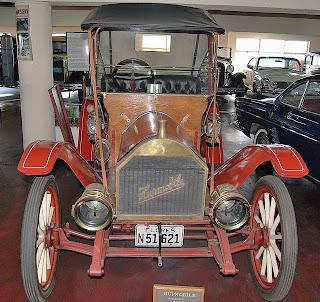 I’m not a car guy, but whenever I visit Uruguay I’m always on the lookout for the classic cars known here as cachilas - at one time, the greatest assortment of antique automobiles this side of Havana. Once common on the road, now mostly parked to attract attention outside the fancier restaurants in Colonia del Sacramento or confined to private collections, they are only rarely taken out for a drive. Many have been sold to collectors outside the country, despite export restrictions. 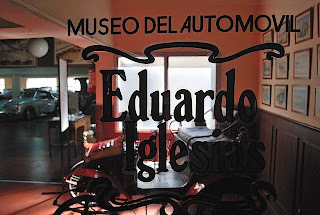 Yesterday, in search of cachilas I hadn’t seen, I took a walk to the Automóvil Club Uruguayo’s Museo del Automóvil in the capital of Montevideo. In the course of many visits to the city, I had inexplicably failed to see it - part of that failure I can ascribe to inconvenient hours and weekend trips when it was closed - but I was pleasantly surprised to find an assortment of motor vehicles that I knew only by name - such as a 1910 Hupmobile (pictured here) and a 1920 Stutz Bearcat. There were also some I’d never heard of, such as a 1904 Clement Bayard, a 1910 Panhard Levassor, and a 1967 Rago - a rarely produced Uruguayan sub-sub-compact. 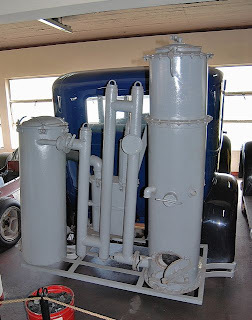 Perhaps the most memorable item in the museum, though, was a vehicle (pictured here) outfitted to run on the "alternative fuel" of charcoal rather than gasoline in the 1940s. Uruguay has always had energy problems - unlike neighboring Argentina and Brazil, it has neither oil nor natural gas - and during World War II petroleum supplies were limited indeed. Uruguay's dilemma is a reminder that, in a world where fossil fuel supplies are declining and political problems can limit access to those that still exist, we need to look beyond the age of oil. On the sixth floor of the Automóvil Club’s downtown parking garage, the museum clearly gets few visitors - you need to sound a buzzer to get in - and there’s one solitary staff member who provides loving maintenance to every vehicle on the floor, all of which are still in running order. 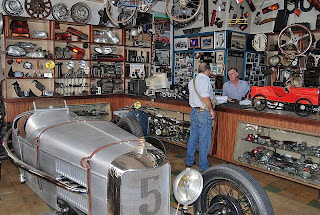 There’s still a cottage industry in restoring these vehicles and those who are interested can see some of the parts in the nearby Casa López (pictured here, at Cerro Largo 1259), which also sports a classic Ford racing car from the 1930s in its showroom. Late last week, I was planning a trip to Uruguay and looking forward to writing about the UNESCO World Heritage Site of Colonia del Sacramento (pictured here), where I’m spending a few days before heading to the capital city of Montevideo and then the fashionable beach resort of Punta del Este. All of these destinations are part of Moon Handbooks Buenos Aires, which I am currently updating. Yet, as the smoke and rubble clear from Chile’s historical earthquake, I think it’s still important to provide some additional information - and testimony - from first hand sources there. I can’t report my own impressions until I return to Santiago in a couple weeks, but I can relate what my contacts there are saying. 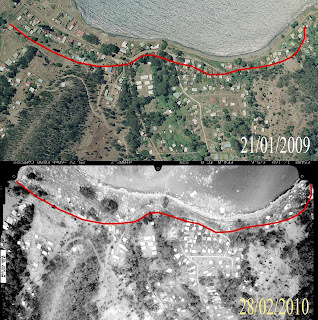 We have learned that the impact on coastal communities, where the Chilean navy failed to broadcast an alert even though some local port officials did, was devastating, even if the fatalities are a minute fraction of those from the Indian Ocean tsunami of 2004. According to Todd Temkin, whose work with the Fundación Valparaíso contributed to the city’s designation as a UNESCO World Heritage Site, “We came through OK, but there is LOTS of damage in Valpo and the South, as you know, will never be the same. The coastal towns of the 7th and 8th regions (Constitución, Pichelemu, etc) no longer exist as we knew them.” Some landmark Valpo buildings, including the Iglesia Matriz and the Iglesia San Francisco, have suffered damage, but the tourist hill neighborhoods of Cerro Concepción, Cerro Alegre, and Cerro Bellavista have come through well. Pichilemu (whose beaches and breaks have made it one of South America’s top surf spots) is especially vulnerable to a tsunami. At Constitución, perhaps best known for a classic narrow-gauge railway that runs from the city of Talca, my friend Marializ Maldonado had been lunching only the afternoon before: “Everything, including the restaurant, disappeared that same night. In that town there are already 300 deaths…I’m telling you this, but I can’t comprehend it, it’s as if I were vaccinated against fear, treated for nerves. You know that in Chile we have earthquakes in our DNA, but even then it isn’t easy.” Chilean novelist Alberto Fuguet has expressed similar sentiments in a New York Times op-ed piece. My Pucón friend Alan Coar was in the countryside north of Santiago, “picking up the pieces in the Río Ligua valley, where I've been trying to help my kid's grandmother with her avocado farm crisis. Lots of damage to old adobe structures generally here. Power and phones coming back on line for the most part.” Things in Pucón itself are fine, except that it’s difficult to travel overland to Santiago. Only a short while ago, I got my first report from someone within the most heavily stricken zone. Franz Schubert of Trekking Chile, a tour operator just outside of Talca (where he also operates the Casa Chueca inn) say that, “Considering the situation of thousands of homeless people and hundreds of deaths in the region, we can’t complain. Casa Chueca and its 30 guests were more than lucky. With water from the pool and vegetables from the garden we had everything we needed. The guests themselves helped us for days, moving the rubble, arranging the furniture, and preparing food. 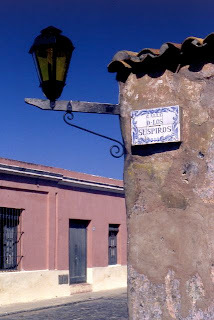 Eventually we got them all to Santiago.” I’ve taken the liberty of including one of Franz’s photos from Talca here. According to Andrea, “Our wineries are operating and will be able to receive the coming vintage. Our Visitors Center will be working normally from next Monday, March 8th. Regretfully, many neighboring wineries are not that well off... We do hope they recover soon.” Her advice for those who wish to help: “The best way to do so, is by purchasing the products and wines of Chile. This will be of great assistance to our country.” On the surface, that might sound self-serving but, in the long run, economic continuity is one of Chile’s greatest strengths.